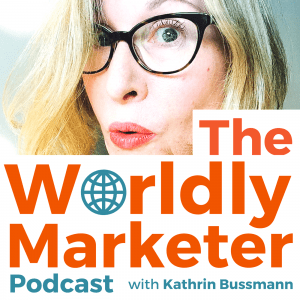 Every week, Kathrin Bussmann talks to a different expert in the field of global marketing to learn more about the challenges and the rewards of reaching out to a multi-regional, multilingual and multi-cultural audience. You can also listen to this podcast via iTunes, Google Play Music or Spotify. Subscribe (it’s free!) via iTunes, Google Play or Spotify, and leave a rating or review. This podcast is brought to you by Verbaccino, in affiliation with Circa Translations Inc. The Worldly Marketer Podcast is looking for sponsors that are a good fit. Interested? Contact Kathrin for more information.